Product code: 714 Categories: Sold Items, Sold Pocket watches. Antique and vintage pocket watches have seen a big rise again in popularity, and this is one that is destined to be admired. A wonderful antique pocket watch made by Cyma around 1920, and fitted in a superb early Art Deco era Niello silver case and complete with its original Niello pocket watch chain. 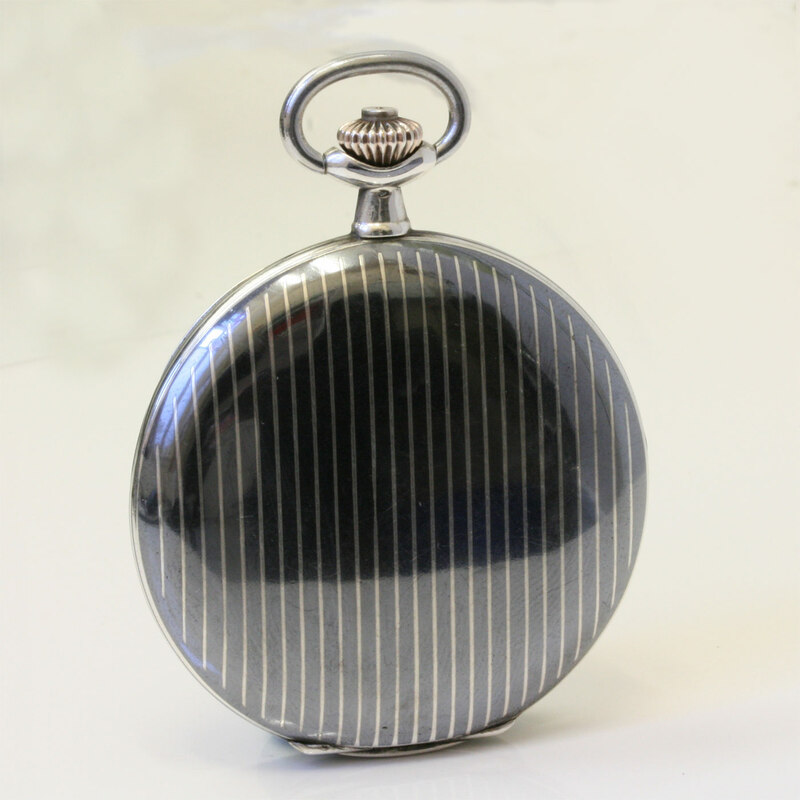 The case measures 51mm and as can be seen has a fantastic striped design of the Niello. The dial is completely original and has no cracks or damage at all, and the hands and numerals are so typical of the Art Deco era of the 1920’s. Here Cyma has fitted a 15 jewelled manual wind adjusted movement that of course has been serviced and comes with a warranty. Another massive bonus is the chain. Very few of the chains were ever made with the Niello, and to get the pocket watch and chain together is a real treat indeed. 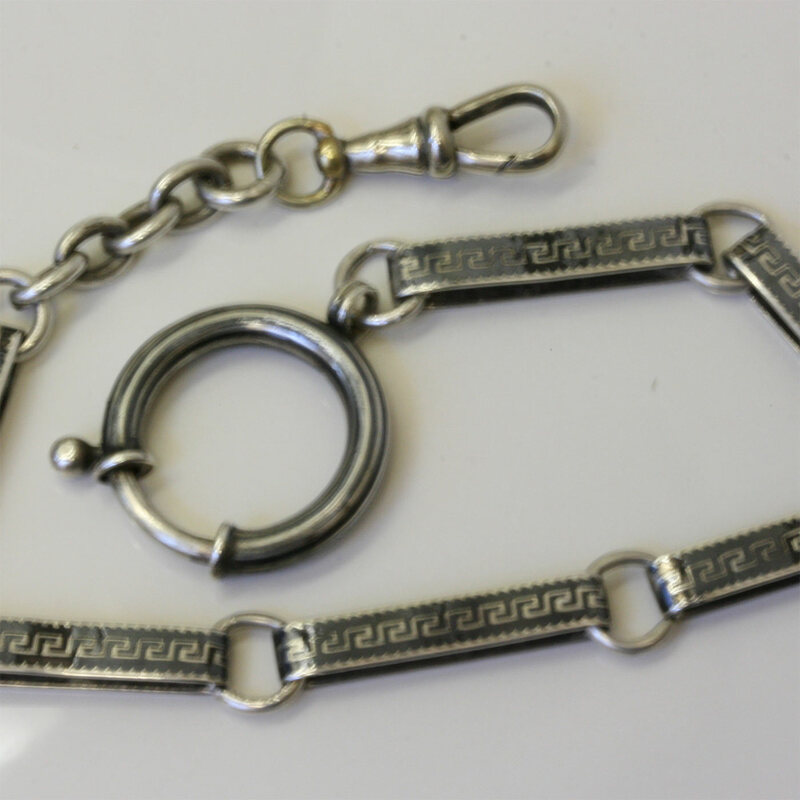 The Chain measures 25cm, and has a swivel at one end and a large bolt ring at the other. the condition of the enamelling on the chain is not as good as the pocket watch case, however it does no diminish from the beauty of the entire piece and is in good condition itself. This would make a wonderful gift for someone for a special occasion, or to be added to a celloection of fine pocket watches.